A good team always has a good general and Deshaun Watson proved that this week. He had the second-highest QB score in the league this week with 24.30 points. 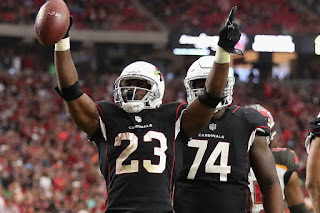 Adrian Peterson ranked eighth in the league in scoring and beat his scoring projection by 153.0%, the fifth-highest percentage in the league. Le'Veon Bell scored 28.10 points, high enough to rank fifth in the league. Mark Ingram scored the second-most points in the league and beat his projected point total by 124.0%, the seventh-highest percentage in the league. Carlos Hyde beat his scoring projection by 112.9% and scored the 10th-most points in the league with 24.50. Leonard Fournette had the eighth-highest score among RBs in the league this week with 21.80 points. Christian McCaffrey put the team on his back with 22.40 points, the seventh-highest score among RBs in the league this week. Michael Crabtree ranked 10th in the league in scoring among WRs this week with 17.20 points. The 20.20 points scored by Jarvis Landry was the sixth-highest score by a WR in the league this week. Adam Thielen ranked eighth in the league in scoring among WRs this week with 18.70 points. Rob Gronkowski ranked seventh in the league in scoring with 26.30 points, his highest output of the season. Cameron Brate scored 19.60 points, the second-highest TE score of the week and the seventh-highest TE score in the league this season. The 17.18 points scored by Tom Brady fell short of his 23.73-point projection, the third straight game where that has happened. It was a season-low 13.54 points for Drew Brees this week. It was also a season-low for his performance versus projections, reaching only 58.5% of a projected point total of 23.15. Matt Ryan needs to step it up! He scored 12.92 points against a projected 19.54 in the win, and has now scored below his projection in five straight games. With 11.10 points, Lamar Miller recorded only 77.7% of his 14.29-point scoring projection. With 1.70 points, C.J. Anderson got only 12.4% of his 13.75 projected points, his lowest percentage of the season. With 8.44 points against a projected 12.81, Tarik Cohen did not meet his projection for the third straight game. Mike Gillislee had a season-low 2.40 points against a projected 9.50 and has now underachieved in four straight games. Julio Jones needs to step it up! He scored 13.20 points against a projected 20.62 in the win, and has now scored below his projection in five straight games. Michael Thomas had two season-lows this week. He scored a season-low 4.10 points and recorded only 22.7% of his 18.06-point projection. With 2.90 points, Chris Hogan got only 19.1% of his 15.18 projected points, his lowest percentage of the season. With 5.30 points, Terrelle Pryor Sr. scored only 42.5% of his 12.46 projected point total. Jamison Crowder scored 5.60 points against a projected 13.00 and has now underachieved in five straight games. Sammy Watkins scored 2.10 points against a projected 11.70 and has now underachieved in three straight games. Jordan Reed scored below his projection in four straight games after scoring 7.70 points against a projected 10.49 this week.